Located in Geleen, the Netherlands, Basic Pharma is well-positioned to serialize its drug packaging, thanks to Arvato Systems’ Arvato CSDB software solution. The contract was signed on 3 November 2017, sealing the cooperation agreement between the two companies. The European Union adopted the Delegated Regulation to the Falsified Medicines Directive in 2016. Since then, the delegated regulation has been incorporated into the national laws of all E.U. member states. This law is designed to prevent counterfeit medicines from being able to access the European market. Under the new directive, all pharmaceutical packaging must bear a unique identifier (UI). All prescription drug packaging will have to comply with this new requirement starting in February 2019. The unique identifier for all prescription medicines that are produced in or imported to the European Union are registered in an E.U. database. When a prescription is dispensed from a pharmacy, a system checks whether the unique identifier exists or has not yet been issued. From the generation of the unique identifier to registration at the E.U. level, the entire process takes place at Basic Pharma using Arvato Systems’ Arvato CSDB software solution. The introduction of the new European system will be monitored in the Netherlands by the Dutch Foundation for the Review of Pharmaceuticals (Stichting Nederlandse Medicijnen Verificatie Organisatie). This organization is implementing the national database, together with Arvato Systems as part of the European system, and will inform all parties about the process. Basic Pharma has deliberately opted for a solution that ensures smooth integration both with regard to the national and E.U. databases and to (new) production machines. Arvato CSDB is an integrated and modular IT solution. Communication in the area of serialization can take place at level 3 (control of the production machines), level 4 (own issuing of serialization codes), and level 5 (from national systems to the E.U. Hub as well as to all business partners). Global IT specialist Arvato Systems supports major companies through digital transformation. More than 3,000 staff in over 25 locations epitomize in-depth technology expertise, industry knowledge and focus on customer requirements. In the healthcare segment, Arvato Systems covers the entire end-to-end process chain with its own serialization solutions. These solutions support both individual manufacturing companies and national verification systems. Arvato Systems has been selected as an official service provider by the European Medicines Verification Organisation (EMVO). We rely on our own team of serialization experts, which has already implemented numerous projects in the international environment. Basic Pharma Manufacturing is a well-equipped niche player in the pharmaceuticals industry. The company, which is based on the Brightlands Chemelot campus in Geleen, the Netherlands, is part of the Basic Pharma Group, a group of independent companies that develop, produce, and supply new medicines. 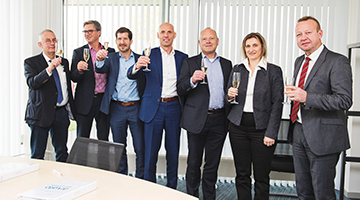 Picture from left to the right: Mr. Piet Meindertsma (Project Manager Basic Pharma), Mr. Oliver Meihorst (Senior Account Manager Pharma Arvato), Mr. Harry Relouw (General Manager & CFO Basic Pharma), Mr. Peter Stemerdink (Key Account Manager Arvato), Mr. Bob Kool (Managing Director Basic Pharma), Mrs. Maja Habets (Manager Production Basic Pharma) and Mr. Anatol Wiebe (Director Arvato Track and Trace).